Sangria is one of those drinks that reminds me of summer. It is a light and refreshing beverage to be enjoyed outside on a patio somewhere, and preferably with some good Mexican fare! I tend to gravitate to red sangria over it’s fruitier white counterparts, because I am not the biggest fan of peach schnapps or flavored brandy. This being said, I also don’t like red sangria that tastes like spiked fruit juice (which is the case at 90% of the bars/restaurants I’ve ordered it from!). You end up drinking like 10 glasses of it in an effort to catch a buzz, only to get a sugar high that is generally followed by a massive migraine the following morning….not to mention the 800 calories you’ve also consumed. No thank you. So tonight, I was on a mission to create my own unique sangria recipe that would taste delicious and also have my friends on their asses after only two glasses. I am proud to say “mission accomplished” with this one-of-a-kind sparkling pomegranate red sangria, which is without doubt the best sangria that I have ever tasted (my friends would second that statement too!). 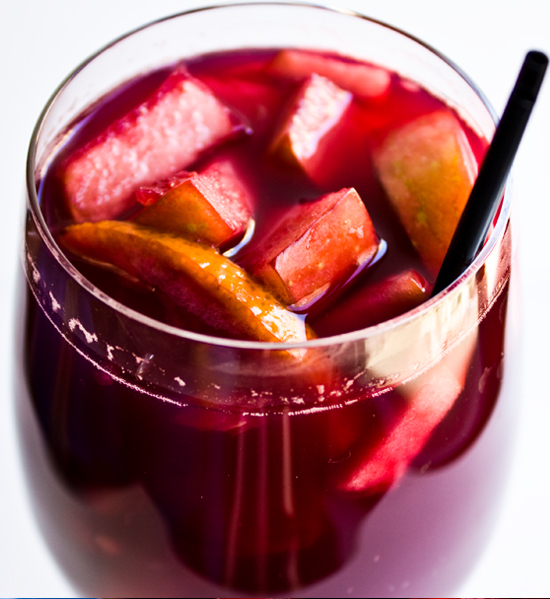 The trick is to allow the flavors to develop overnight, by making the sangria ahead of time. 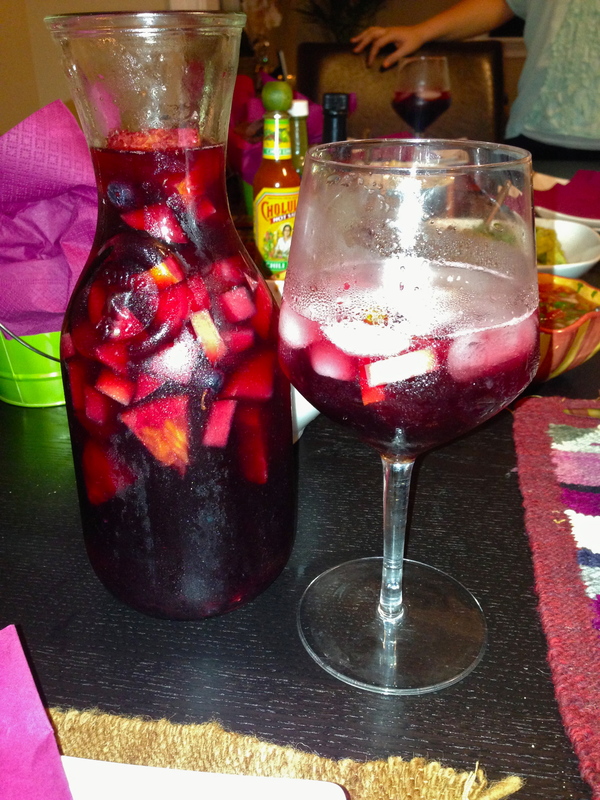 I also like to use a merlot wine as the base of the sangria because it is a dry wine but has natural hints of berries, plums, and currants, which lend themselves well to the other fruity flavors, especially the pomegranate spritzer used to top off the beverage before serving! In a mixing bowl, combine the chopped fruit, brandy, triple sec, and orange juice. Cover and allow to soak for 2 hours. Add the wine to the mixture and allow to sit over night in the fridge. To serve, fill a glass with ice, fill ¾ with the sangria, and top off with a splash of sparkling pomegranate juice. Stir to combine.